Are you a chick lit lover like me? Have you been waiting for a nice fun chick lit to dig into? If the answers to these questions are yes, then worry not, because you are going to read about a book which will be one of the most epic chick lits that you will be reading this year. What Kitty Did is a fun filled ride into the world of the perpetually distressed Kitty and her barely functional love life. Who is Kitty and what did she do? What Kitty Did is the story of Kitty (or Ketaki as her real name goes) who is a journalist working for a fashion magazine Poise. Her love life is as trashy as her salary, but she relishes the company of her friends who make her forget all her woes. While Kitty battles each day with her characteristic bad luck and clumsiness, her Mom is busy match-making her up with a handsome but difficult-to-read guy and now Kitty has no clue about what future holds for them. 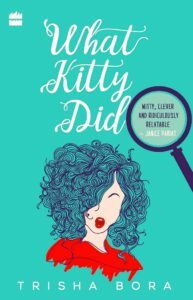 As if that isn’t enough, Kitty has a penchant for inviting trouble and the latest mess that she has got herself into has something to do with the murder of Roxy Merchant; a yesteryear film actress and the wife of a powerful cultural attaché. While Kitty is sure of uncovering something important, she doesn’t know that danger lurks just around the corner and she better mind her ways before it is too late. So, what will happen to Kitty? Will her love life ever get better? Will she uncover the mystery behind Roxy Merchant’s death? To know this and much more, read this compellingly hilarious novel today! The plot of What Kitty Did is rather simple. As the story is told in Kitty’s voice, the plot majorly focuses on Kitty. It does have some sub plots to keep the readers engaged and give them an idea about Kitty’s surroundings. Though it isn’t the best plot I have across in a chick lit, it surely is a decent one. The characters are what steal the show though. They make the book come alive to the reader. They add the necessary masala and spice making the book the compelling read that it is. I simply adored Kitty. She has all essential qualities that make her a great chick lit protagonist. She is the damsel in distress with a confused love life and crisis at work situation who is independent yet humble and has a heart of gold. This is what makes her endearing to the readers. The other characters too are an amusing bunch. I especially enjoyed the characters of Scum, Grandpa, Kitty’s Dad, Kitty’s Mom, Naina, and Kitty’s friend Rimi. Most of them are hilarious in their own eccentric ways. To cut a long story short, What Kitty Did possibly has the best ensemble of hilarious characters I have seen in a long time. The writing style of the author is praise worthy too. Her writing is filled with humour and wit, not the low-key kind which amuses you subtly, but the type that makes you laugh your guts out, often quite embarrassingly. The humour is what makes this book a winner and a must-read recommendation. Was the end worth it? And what did not click? The climax of the book is simple, nothing that will surprise you but at the same time, it gives a befitting end to Kitty’s story. The only thing which I did not like about the book was its length. In my opinion, it was unnecessarily lengthy. The book was 300+ pages without the story actually needing that many pages. On top of it, there was the issue with the font, it was a bit too small for my taste and convenience. That being stated, overall if you ask me, What Kitty Did is a great entertainer and therefore I recommend it to all my readers who enjoy chick lits.